PORT HUENEME — Frank Oakes is betting his future on a snail. Thousands are suctioned onto the walls of 19 outdoor aquaculture tanks behind his office in Port Hueneme, California, south of Santa Barbara. Shaped like oblong cinnamon rolls, the black, tan, and striped snails may live up to 60 years, although their population may be dwindling. “This fragile California resource could be the basis of multiple life-saving drugs,” said Oakes, who is the CEO of Stellar Biotechnologies Inc., a biomedical company. Giant keyhole limpets contain a valuable protein called KLH, or keyhole limpet hemocyanin, which is being tested in more than 20 different types of cancer vaccines and on autoimmune diseases like Alzheimer’s. Since the 1990s, limpets have been raised in captivity and their blood is being tested in treatments for cancer and autoimmune diseases. 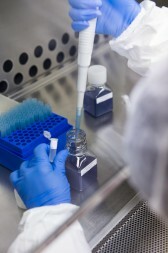 Photo: Stellar Biotechnologies, Inc. The copper-based blood protein carries oxygen through the snail’s body, as hemoglobin does in humans. In the 1950s, immunologists found that inserting KLH into patients triggered a powerful immune response. Such responses are critical in helping the body fight cancer and other diseases. So researchers have figured out how to take markers for a specific type of cancer and attach KLH before inserting them into a vaccine. Once administered, KLH wakes up the immune system and the patient’s antibodies see the markers. Like a signpost, the markers point toward the patient’s cancer. This process trains the immune system to fight the patient’s specific type of cancer. “The hope with the cancer vaccines that contain KLH is that one day they will be preventative, much like the vaccines for measles and polio are today,” said Catherine Brisson, chief operating officer of Stellar Biotechnologies. “This fragile California resource could be the basis of multiple life-saving drugs” — Frank Oakes, CEO Stellar Biotechnologies, Inc.
KLH-based vaccines are in phase III clinical trials, the last stage before a drug receives commercial approval from the Food and Drug Administration. Other countries, including South Korea, China, and the Netherlands, have already approved KLH-based cancer vaccines. Stellar sells the purified blood protein to international companies for $50,000 per gram. But generating a steady supply of KLH is tricky. Giant keyhole limpets only live off the California coast and no one knows how many exist in the wild. 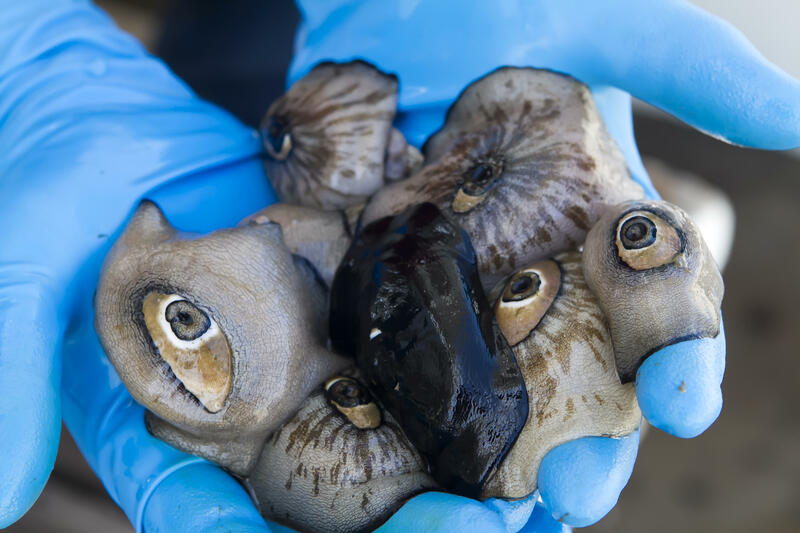 Most international pharmaceutical companies collect mollusks from the ocean, which are frozen and shipped overseas or bled to death and thrown back into the water. One gram of the snails’ purified blood protein is sold to pharmaceutical companies for $50,000. Photo: Stellar Biotechnologies, Inc.
“I have been working in our kelp forest since 1970 and have seen [them] become much more rare over the years,” Paul Dayton, a marine ecologist at Scripps Institution of Oceanography, said in an email. What’s important, he said, is preserving a marine habitat that is vastly under studied. Dayton argued for restrictions on the number of snails that can be removed, since there are no catch limits. And while Stellar is no longer taking limpets from the wild, it is relying on a supply that may not last if KLH-based treatments are approved. “Should any of these clinical trials hit the jackpot, we don’t have a huge reservoir of these animals to supply the need for further clinical trials and treatments,” said Martin. This story was made possible, in part, by support from the Institute for Journalism & Natural Resources.